The enlightened women or female figures named below all come from Vajrayana or "Tibetan" Buddhism, the school of Mahayana which originated in India and later moved to Tibet and the other Himalayan countries. Hence, most figures are identified first by their Sanskrit name, with the alternate Tibetan form appearing in parentheses. When it is the other way about, e.g. Achi Ch�kyi Drolma, Machig Labdr�n and Palden Lhamo, it is because their practices developed or were practised principally in Tibet. I have also indicated the type of deity each is, i.e. A thangka (pronounced tonka, as in tonka bean) is a Tibetan painting on cloth, stored scroll-fashion when travelling. For those who wish to learn more about what thangkas are and how they are created, the Dharmapala Centre in Bremen, Germany has an excellent English-language page which explains the process. This page will be continually updated as I discover more links (and find the time to expand upon the descriptions of the deities). My apologies for any inaccuracies that may arise from my ignorance or haste; your corrections are most welcome. Note: I would love to add more images of female Buddhas and bodhisattvas, provided that my doing so does not violate copyright. If you have any that I may use, please let me know so that this page can be as visually inspiring as possible! SPECIAL THANKS to New York's Padmasambhava Buddhist Center who have given their kind permission for me to illustrate this page with selected images from their beautiful online thangka gallery. Most of the deity images below are theirs. Achi Ch�kyi Drolma (Tib. A-chi Chos-kyi sGrol-ma) is a female Dharma protector whose practice was introduced by Drikung ('Bri-gung) Achi, the matriarch of the Drikung hereditary lineage. She is white-coloured and is usually portrayed seated and riding a snow lion, the legendary white animal of Tibet; she may also be shown standing (see right). Unusually, for a Dharma protector, Achi Ch�kyi Drolma's aspect is not wrathful, but peaceful. NEW See Achi Ch�kyi Drolma - Chief Protectress of the Glorious Drigung Kagyu for the story of her origins, an image of the deity, and a description of her iconography. Dorje Yudr�nma is said to be one of Tibet's chief protectors. She holds an arrow with the five colours in her right hand and a white silver mirror in her left. The lifestory of the Longchen Nyingthig yogi Jigme Gyalwai Nyugu (from the Dzogchen Lineage of Nyoshul Khenpo) relates that an emanation of this deity appeared and offered him food once when he was suffering hardship and poverty. Dorje Yudr�nma is associated with a divination practice which uses a mirror. The Art of Tibet site includes a good thangka of Dorje Yudr�nma. Ekajati is a female dharma protector especially popular in Nyingma, where she is also considered a protectress of Dzog Chen. She is cognate to Palden Lhamo. The Nyingma form of Ekajati (whose name literally means 'One Plait' or 'One Braid') has one tuft of hair, one eye, one mouth, one breast -- and sometimes only one leg! -- to demonstrate her singleminded devotion to Dharma. 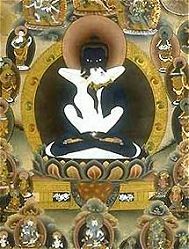 Whenever a Nyingma refuge tree or series of protectors is portrayed, Ekajati is usualy the dark-red central figure in the bottom row (see the thangka of Dharma protectors of the Nyingma tradition from the Chagdud Gompa site); however, she may be depicted as dark-blue or black, rather than red. In the Sarma (New Translation) schools Ekajati is regarded as the mother of Mahakala and Mahakali (Palden Lhamo). NEW Chopa.com has a particularly lovely thangka of Ekajati. Ekajati is also the name of a wrathful form of Green Tara known as Black Tara. She is depicted in seated posture holding a curved knife and skullcup. This form is often shown in a triumvirate with Avalokiteshvara and Green Tara. This unidentified thangka from Andrew Stinson's thangka website also depicts Ekajati. Kakasya is a guardian goddess with the face of a crow: one of the bird-headed goddesses associated with the mandalas of various tutelary, or personal, deities. The Asian Art Museum included a delightful statue of Kakasya in its Mongolia exhibit. This female Bodhisattva is variously known in China as Kuan Yin (or Kwan Yin, Quan Yin, Guanyin or Koon Yum), in Japan as Kannon or Shokanzeon Bosatsu, and in Korea as Kwanseum Bosal or Kwan Um. She is regarded as being identical to the (male) Tibetan deity Avalokiteshvara (Tib. Chenrezig), but also has much in common with the female Tibetan deity Tara. Temple of Kwan Yin. A virtual temple dedicated to Kwan Yin, Bodhisattva of Compassion in both English and French. Contains a gallery. A scroll of Guanyin from the Dunhuang Buddhist complex, dated to 968 AD, and a statue of her from Rehe (China). UPDATED A free Guan Yin screensaver from Toronto's Cham Shan Temple. Thangkas of Kurukulla on the Art of Tibet site: thangka #322, a stunning, "pale red" Kurukulla surrounded by dozens of her emanations, thangka #422 (on a red background, with Palden Lhamo below), thangka #655 - a clear and simple representation, and thangka #765, a very dramatic depiction of the deity. A thangka of the mandala of Kurukulla is on the Tibet Shop site. In Geluk tradition Kurukulla is sometimes also referred to as Red Tara [presumably because of her appearance]; but this name can also refer to a completely separate yidam. In the Hevajra Tantra, Kurukulla is a semi-wrathful female power deity, red, in essence Hevajra, and unrelated to Tara. The Asian Art Museum of San Francisco included a Mongolia online exhibit which described a statue of Lamanteri thusly: "Lamanteri is the Mongolian name for this wrathful form of the goddess Tara depicted with the third eye and four pairs of hands." The eleventh-century Tibetan founder of the ch�d (cutting) practice, Machig Labdr�n is usually depicted in deified form as a peaceful white dancing figure with three eyes, playing a damaru (two-sided drum) with her right hand and holding a bell with her left. (She is also depicted in seated form on Miya Shimada's Ch�d Club site.) Thangka #349 on the Art of Tibet site depicts Machig Labdr�n's life story, and thangka #223 shows her at the centre of a Nyingma ch�d lineage tree. Alex Clarke's Chaos/Ch�s page includes a depiction of Machig; and although it is iconographically incorrect (e.g. the image's proportions are incorrect; she should be white, not pink; etc. ), I include it here because it is an intriguing example of what may become the wave of the future: computer-generated deity images. There is also a short article about Machig Labdr�n in Polish (Maczik Labdryn) on this Polish Buddhist site. NEW Aro gT�r includes a particularly lovely line drawing of Machig with accompanying article. Other depictions of Tr�ma on the Web include solitary Tr�ma (Chagdud Gompa), Tr�ma Five Deity (Art of Tibet), and Tr�ma Nine Deity (Chagdud Gompa). Mahamaya was the mother of the historical Shakyamuni Buddha, Siddhartha Gautama -- this name means 'Great Illusion.' See also Mayadevi. There is also a male anuttarayoga deity named Mahamaya who is not to be confused with the Buddha's mother; this practice is found in all the Sarma (New Translation) schools and was originally made famous by Marpa; it is also found in the 'Five Deity Tantra' practice of the Shangpa Kagyu. An Indian-born princess who became the spiritual consort of Padmasambhava, founder of Buddhism in Tibet (his second consort was the Tibetan-born Yeshe Tsogyel -- see below). She appears in deified form as a yidam of long life, wearing the ornaments of a bodhisattva. Her right hand holds an arrow (a symbol of Dzogchen) adorned with banners and a melong (a round mirror, representing the clear, reflecting nature of mind). Mandarava sits in the manner of Tara, with right foot extended, to show her willingness to help sentient beings. Marici (pron. Marichi) is a red-coloured female yidam associated with the sun and with dawn; her name in Tibetan is �ser Chenma, i.e. [goddess of] Great Light. Her mantra is traditionally used as protection by travellers. Marici has an orange-coloured body (the colour of the sun at dawn), and three faces, eight arms and two legs. Of the three faces, the first (central) is orange and smiling, her right face is red, and her left is the face of a white boar: each has three eyes. Her first right hand holds a vajra at the heart in the mudra of teaching, the second holds a vajra axe, the third holds an arrow with the tip pointing downwards, and the fourth, in the mudra of generosity, holds a (sewing) needle. Her first left hand, in the mudra of teaching, holds the stem of a plant (tree?) whose crown is at the level of her left ear (next to the boar's face). Her second left hand holds a bow, the third holds a thread (? ), and the fourth holds a noose ending in a loop and hook. Marici's right leg is extended in the manner of Tara, while the left is tucked in. She is dressed in the royal robes of a bodhisattva: five-pointed crown surmounting each face, jewels, silks and so forth. Marici rides a throne/chariot drawn along by seven white boars. Queen Mayadevi (also Maya or Mahamaya) was the historical mother of Sakyamuni Buddha. She died not long after his birth, but is believed to have been reborn in one of the heavens where he later manifested and taught her the Dharma so that she too became enlightened. She is traditionally depicted just as she was about to (painlessly) give birth, standing and holding the branch of a tree in her right hand. This dark-blue figure appears as both a single yidam and also in union with her consort, the Highest Yoga Tantra male yidam Hevajra. The name means 'No-Self' in Sanskrit. This was also the name of the wife of Marpa (whose main practice was Hevajra) -- the founder of the Kagyu lineage of Tibetan Buddhism. This woman was a formidable mahasiddha, variously described as the sister or consort of Naropa. She founded the practice known as The Six Yogas of Niguma (see Glenn Mullin's text The Six Yogas of Sister Niguma, which includes a vigorous line drawing of Niguma). Palden Lhamo (whose name translates as "Glorious Goddess") is the only female dharma protector common to all four schools of Tibetan Buddhism. She is very wrathful, and rides her mule through a sea of blood, surrounded by wisdom fire. She is dark blue and has one face with three eyes; she wears a sun at her navel and a moon at her crown, and over her is a peacock umbrella (a traditional symbol of protection). She is variously depicted, but her most common forms are two-armed and four-armed. There is also a system of divination by dice associated with her. She is sometimes considered cognate to Sarasvati or Tara, but is at the same time a wrathful form of the peaceful goddess Sri Devi. An article on the iconography of Magzor Gyalmo (a form of Palden Lhamo) by Natalie R. Marsh, with an accompanying thangka image. From the Mirrors of the Heart-Mind exhibit. Prajnaparamita embodies the bliss/emptiness that gives rise to all phenomena -- hence her honorofic title as Mother of all the Buddhas. She usually appears as a tranquil seated figure clothed in silks; her body is gold in colour, and she has one face and four arms. Her first two arms are held in meditation posture in her lap, while the other right hand holds a nine-spoked vajra (thunderbolt sceptre symbolising compassion/bliss) and the left, the text of the Heart Sutra which is the essential wisdom-text on the emptiness of phenomena. There are other forms of the deity, as at right: her first two hands in prayer mudra at the heart, second right hand holding a mala [rosary] and second left hand holding a text. Her name means 'Perfection of Wisdom'; in Tibetan she is also known as Yum Chenmo, or 'Great Mother'. She is closely associated with ch�d practice (see Machig Labdr�n). Natalie R. Marsh offers an essay on the iconography of Prajnaparamita (along with an accompanying thangka image). From the Mirrors of the Heart-Mind exhibit. Samantabhadri (Kuntuzangmo in Tibetan) is the consort and female counterpart of Samantabhadra/Kuntuzangpo, the primordial Buddha of the older schools of Tibetan Buddhism. They are usually shown in sexual union (yab/yum in Tibetan), the blue male figure and white female figure embracing each other in lotus position. Samantabhadri is sometimes shown alone, in which case she is seated in lotus posture with her hands in meditation posture in her lap. Samantabhadri is always shown naked (as is her consort) to demonstrate the unadorned nature of Absolute Truth, the emptiness of all phenomena. She is in some senses an analogue of Prajnaparamita. A near equivalent of the New Translation schools is the dark-blue Vajradhatu-ishvari, shown in union with consort Vajradhara as the yab-yum Vajradhara / Vajradhatu-ishvari. Simhamukha (Tib. Seng-gdong-ma or Seng-dong-chen) is a wrathful dancing dark-blue figure similar to Vajravarahi in appearance and ornaments, holding a curved knife in her right hand and a skullcup in her left, except that she also has the face of a lion -- hence her name in Tibetan and Sanskrit (meaning "lion-face"). Her practice was founded by a woman, Jetsun[ma] Lochen. Simhamukha's practice is found in the Sarma (New Translation) schools is associated with the Chakrasamvara Tantra. Examples of her iconography on the Web are a statue on the Dharmaware website, and two glorious images on the Art of Tibet site: thangkas 424 and 419. This mahasiddha belongs to the mother lineage of ch�d. Her name means 'good or blissful siddhi' (a Sanskrit word meaning a miraculous accomplishment, which can be either mundane, e.g. healing, flying, etc., or supramundane, i.e. the siddhi of full Enlightenment). She compiled her own six yogas (see also Niguma) which she gave to Khyungpo Naljor, the founder of Shangpa Kagyu. Also known as Drolma (Tibetan), Tara embodies the compassionate activity of all the Buddhas (her name means "the liberator" or "she who saves"). She is pictured with one face, two arms and a green-coloured body. Her right hand is outstretched in the mudra (sacred gesture) of generosity, and her left holds the stem of a blue lotus which blossoms at her left ear. Download a Windows wallpaper of Tara (available in several sizes) from the Green Tara Gallery, computer-created by Osel Shen Phen Ling webmaster Bob Jacobson. Bodhisattva of Compassion: The Mystical Tradition of Kuan Yin by John Blofeld (Boulder: Shambhala, 1978) -- a study of Avalokiteshvara, the Bodhisattva of Compassion, in the female forms of Kuan Yin (Chinese) and Tara (Tibetan). This form of Tara, Green Tara, is the most common one; but Tara also appears in other forms, such as White Tara, Red Tara and the Twenty-One Taras. In the Gelukpa school there is also a Highest Yoga Tantra form of Tara known as Cittamani Tara (as well as a Highest Yoga Tantra form of the Twenty-One Taras practice). See the Praises and Requests to the Twenty-One Taras on the Osel Shen Phen Ling site for an example of a kriya-tantra sadhana (meditation text), as well as NEW the Britannica entry on Tara for a more scholastic look at the deity. Red Tara is a special practice of Tara practised in both the Nyingma and Sakya schools. 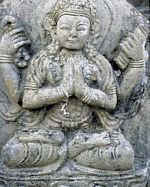 She is depicted in much the same way as Green Tara (seated with right leg slightly extended, left hand held to the heart with an utpala flower blooming by her left ear, and right hand making the gesture of generosity), except that her body is ruby-red, she possesses a third eye, and her right hand holds a long-life vase. There are lovely thangka reproductions of this deity (both solitary and amongst her mandala deities) on the Chagdud Gompa site, which also offers a photo of a Red Tara statue with the bow-and-arrow attributes of Kurukulla (to whom she can be related). See also the Art of Tibet site (e.g. thangka 331). Red Tara can also be either one of several out of the various sets of twenty-one Taras, or in the lower tantras (Kriya or Carya). Also known as Drolkar (Tibetan) or Sitatara (Sanskrit), Tara embodies the compassionate activity of all the Buddhas (her name means "the liberator" or "one who saves"). White Tara is especially associated with long life and wisdom. Unlike the green form of this deity, White Tara has seven eyes -- one in each hand and foot, and a third eye on her face -- to show that she sees and responds to suffering throughout the universe; and she sits in full lotus posture. See also the White Tara page (from the Arya Tara website) which describes some of the differences between this Tara and the Green Tara. The Osel Shen Phen Ling site includes a long-life sadhana (practice text) of White Tara. Tseringma is the foremost of the Five Long-Life Deities -- formerly mountain-guardian spirits -- who plagued the great Tibetan yogi Milarepa during his cave retreats. They were converted to Buddhism and Tseringma became his consort. She is a white figure shown riding a snow lion and carrying a long-life vase in her hand. Thangka 433 on the Art of Tibet website depicts Tseringma and her sisters. This white-coloured deity, a form of Tara, is a female counterpart of the thousand-armed form of Avalokiteshvara. She has one thousand faces, arms and legs; each face has three eyes, and she has one eye in the palm of each hand and the sole of each foot, showing that she watches and protects sentient beings. Her central faces are white (as is her body); her right faces are yellow, the faces at the rear of her body are red, and the left faces green; there is also a "tier" of blue faces at the top of her head. Her right hands hold wheels of the Dharma (dharmachakra) and her left hands hold arrows; one of her other left hands also holds aloft a white parasol which also symbolises her protection. There is a lovely thangka of Ushnisha-sitatapatra (#429) on the Art of Tibet site. Robert Chung's website also includes an illustrated sadhana [ritual text] of this deity. Ushnisha-vijaya (Tib. Namgyalma or Namgyelma) is a peaceful white deity and an emanation of Vairochana Buddha. She has three faces, ten eyes and eight hands. Her right hands hold a lasso, bow, and vase with the nectar of immortality; her fourth right hand bears an eye in the palm and is in the mudra (posture) of generosity. Her left hands hold a miniature Buddha image, a double (crossed) vajra, and an arrow; the fourth left hand is held in meditation posture in her lap. Ushnisha-vijaya is often shown in a triumvirate with the other two principal long-life deities, red (male) Amitayus and White Tara (see above). Robert Chung's Namgyelma page includes a picture and her two mantras. Vajrayogini (Tib. Dorje Naljorma, Adamantine Female Practitioner) is the principal female yidam of Highest Yoga Tantra of the New Translation schools of Tibetan Buddhism. She is a slightly wrathful red female figure shown holding a curved knife in her right hand, a skullcup in her left and a khatvanga (trident or staff) in her left elbow. The Naro form of Vajrayogini, most commonly seen in the Sakya and Geluk traditions, is shown standing with her face turned upwards and to the left, with the skullcup held up to her mouth and the curved knife pointing to the ground. The Vajravarahi form of Vajrayogini, generally more frequent in Kagyu, is shown in dancing pose with the right leg bent; this form holds the curved knife up in the air and the skullcup to her heart. Vajravarahi, whose name means Adamantine Sow, is usually shown with a small sow's head, representing triumph over ignorance, emerging over her right ear. In either form of this deity she may be visualised as a solitary yidam or in union with her consort dark-blue Heruka Chakrasamvara, a principal mother-tantra deity of Highest Yoga Tantra. A lovely statue of Vajravarahi (in karma dakini form) from the Mirrors of the Heart-Mind exhibit. A poem -- Homage to Vajrayogini -- written by Mark Webber. From Cyberkaya. A most remarkable multi-faced and multi-headed form [mis]identified as "Vajrahari", from an Indonesian website; any information on this aspect of Vajravarahi would be most gratefully received! This remarkable female hermit-saint, the Tibetan consort of Padmasambhava, is sometimes shown in Nirmanakaya form -- the 'emanation body' a Buddha takes so as to be visible to ordinary beings -- as a woman in everyday Tibetan clothes, seated and holding curved knife and skullcup. She is also shown in deified form as the Queen of Great Bliss (Tib., Dechen Gyalmo) as a red standing figure with a damaru (double-sided drum) raised in her right hand and a curved knife held to the ground with her left. Yeshe Tsogyal's sacred biography may be read in Kevin Dowman's Sky Dancer: the secret life and songs of the Lady Yeshe Tsogyel (London: Arkana, 1989) and Tarthang Tulku's Mother of Knowledge: The Enlightenment of Ye-shes mTsho-rgyal (Berkeley: Dharma Publishing, 1983). The meditation practice of Dechen Gyalmo, Queen of Great Bliss, is discussed in Anne C. Klein's Meeting the Great Bliss Queen: Buddhists, Feminists, and the Art of the Self, which has a lovely cover illustration of the deity.